With a small group on the Vision of the Seas, for an early June sailing, I was a little nervous about the weather in Alaska. I knew Royal Caribbean International would deliver a solid cruise experience, but the weather is always the unpredictable part of planning an Alaska vacation. As it was, we had both a perfect cruise and great weather. From the seamless embarkation, to attentive but unobtrusive service onboard, the staff on the Vision was always smiling and friendly. There was an excellent variety of music and entertainment. The shows at night were well attended and top comedians were on board. I really did not know what to expect from Icy Strait as this is only its third year as a cruise ship port. It was really my favorite port as I felt it really gave more of the flavor of the real Alaska. I enjoyed the tour. The guide who lives on the island year round gave a local perspective that was enlightening. The passengers who went fishing had nothing but praise for their experience and everyone that I spoke with about fishing caught at least two big fish. The food is good for a big ship. The coffee is very good all over the ship. Room service receives high marks for promptness and accuracy. When my room service waiter did not think I had ordered enough food for breakfast he added a plate of pastries, a very sweet touch. Service in all areas of the ship could not be improved. The solarium is a GREAT adult's area with a retractable dome over the pool and hot tubs. Padded lounge chairs and floor to ceiling windows make this THE place for viewing the world. The only down side to this area is that it is the only place serving food after 9 PM and it only serves "kiddie" food; pizza which tastes like cheap frozen pizza, hotdogs, fries etc. I think this should be moved to a kid's area and more adult fare presented. When this suggestion was made to the hotel manager he said that this problem might be addressed during the next dry dock??? The only glaring deficiency with this ship is one not related to age of the vessel. The deficiency is more of a Management decision in the poor quality of mattresses, pillows linens and towels. This has been true of every Royal Caribbean International ship I have sailed on and I have been on 11 sailings. I am surprised that since even Carnival has upgraded this area fleetwide that Royal Caribbean has not stepped up to the plate to try to make the in cabin experience all that it can be. This again was addressed by the hotel director and he said these items, with the exception of towels, will be addressed by the end of the year. It will be the same linen venue currently on the Freedom. The maintenance of this ship was impeccable. Outside and in, one could not tell that this ship is over 10 years old. The vast amounts of glass and the beautiful public areas surrounding them were well utilized and did not seem at all dated. 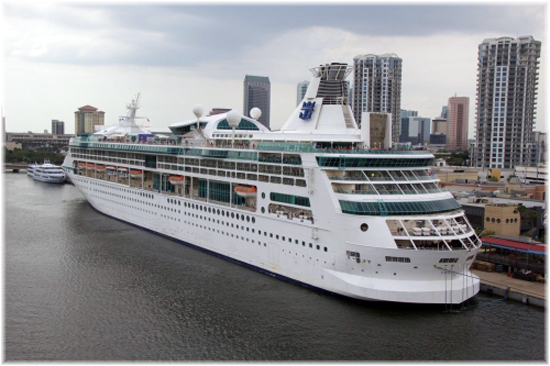 Royal Caribbean International deck plans are always logical and easy to navigate. For a mass market ship, this is a 9 out of 10, marking down only for lack of appropriate food service after 9 PM and bedding and linens. Early June sailings offer two advantages that were important to my group, reduced numbers of children and very few mosquitoes. An added bonus was the spring wildflowers. Temperatures were unseasonably warm but even so, the advice to layer held true. I had to buy a T shirt in Juneau as I did not anticipate 88 degree weather. My group liked sailing from Seattle with most doing pre-cruise stays. We stayed at the Executive Pacific Plaza, a historic hotel with a central location and reasonable rates. My group all found reasonable air rates. Most of the group took inside cabins and most preferred them due to the long days, since many have light sensitivity. They especially liked inside cabins for napping. Although internet is available, those of us who are use to high speed will find it frustrating and expensive. I found my Blackberry handy as it received text and email in every port. The cost for internet onboard the ship is 50 cents per minute. Royal Caribbean International has not yet perfected disembarkation. It was not a pleasant experience. They wanted all passengers not only out of their cabins, but also the Windjammer and most public areas except the theater. The warning that your luggage may not be ready is correct! The best bet is to try to find a deck chair out of the way and read a good book until after your color is called. We were some of the last off and we were in the taxi at 10:30 AM. Avoid the downtown Enterprise rental car location. It took an hour and a half to pick up a car. This is probably just a problem on cruise ship days, as there were 3 ships in port. The first megaships of the Royal Caribbean Cruise fleet (the Sovereign series) are classified as third generation ships, mainly because of their size. But they also could be defined as the last development of the second generation, because they share diesel- mechanical propulsion engines, the absence of cabins with balconies, the size of the cabins, etc. 1. RCI is opening new markets outside the Caribbean: Bermuda, US West Coast, and Europe. The new ships will be faster to meet the Caribbean requirements. The first two will have a speed of 25 knots and the others a service speed of 22 knots. 2. RCI adopts the same design concepts that were used in her first ships (the original trio Song of Norway, Nordic Prince and Sun Viking). The public rooms are situated in the top deck of the hull and in the bottom deck of the superstructure, with the theatre in the bow of the superstructure and dining room in the centre of the ship, both double height. Between them are situated all the typical attractions of this company: Casino Royal, Champagne Bar, etc. 3. Two of the trademarks of RCI are combined in the Vision ships. The upper part of the atrium was raised to join the Viking Crown Lounge opening up the entire ship to natural light and integrating the two spaces. So, a passenger can reach the Lounge by utilizing the panoramic elevators of the Atrium. In the first two ships, the Viking Crown is integrated in the funnel, which gives to you a superb view. But in the last four, the funnel is aft, separated from the Viking Crown, which is placed amidships, and the exterior profile of the ship suffers notably. 4. Instead of one lido deck with two pools, RCI built two lidos, like the Carnival ships. One pool is open with a sliding roof. The second, called the Solarium, has a special theme decoration which is different in every ship (Egyptian, Mayan, Roman, etc.). 5. The six sister ships have a large percentage of external cabins with balconies. Although the cabins are larger than in the Sovereign class, they are smaller than the cabins of the competing lines. The smallest of the external are 14.3 square metres and the smallest of the internal are 13.5 sq. The Royal Suite is 103.7 sq and has a piano and a jacuzzi. 6. All the ships have diesel-electric propulsion. The first two ships are fitted with 5 diesel generators whish are situated in the centre of the ship to avoid trim problems. The last four ships were fitted with a stern thruster. The last four have dynamic positioning, that permits them to avoid using an anchor in some calls, to prevent harming marine life. It is also is very useful for manoeuvring in port. 7. 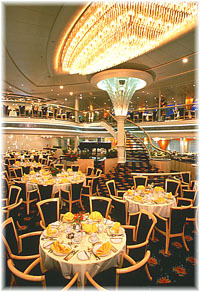 The six ships have a two level dining room located in the centre of the ship, with the two galleys aft. The upper one is an open terrace with floor to ceiling windows. 8. Vision was designed to maximise the use of natural light and to soothe with an abundance of woods and art works of various types wherever you gaze. She is the last ship of the class. The Vision is a sister of the Rhapsody of the Seas also delivered last year by the French yard Chantiers de L'Atlantique. The Vision doesn't have the same engine trouble that forced the Rhapsody into dry-dock for two weeks last October and she ran very well in her first European season. She sailed in stormy seas from St. Nazaire to Southampton on April 18, 1998 and from April 24-28, hosted a series of inaugural events for the UK travel agents. On May 2, she made her first long range cruise from Southampton to Barcelona, her summer base for a series of weekly cruises until August 22. After the transatlantic voyage, she cruised to Canada and New England from Boston. Even the most dedicated small-ship enthusiast would be impressed by Vision of the Seas. She is a beautiful ship from bow to stern, and although as large as its predecessors of the Sovereign class, RCI has designed her to create the atmosphere of a smaller ship. have been distributed over 12 decks, but the public rooms are mainly in three decks: the Main deck, the Promenade deck, and the Mariner deck. These decks are surrounded by lifeboat stations. They are located so as not to disturb dining rooms or lounges used for daytime activities, and don't restrict views from any of the cabins. The atrium, designed by Njal Eide, is magnificent and constitutes the heart of the ship (RCI pioneered the concept of an open atrium lobby in its Sovereign class ships). She has almost the same design and dimension as the other Vision class ships, but the four newest ships have the advantage that the passengers embark on the lower deck, improving the orientation on board. 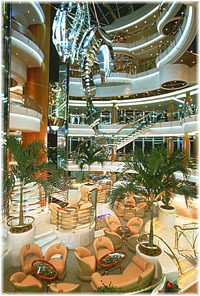 The Vision's Centrum extends from the Main Deck all the way up to the Sun Deck and beyond to the Viking Crown Lounge. There is a huge stainless steel and neon sculpture, called Ariel, by the British sculptor Peter Layton, and two panoramic glass elevators. It is less brassy and glitzy than the other ships, which enhances the soothing nature of the ship's design. The base of the Centrum is the Champaign Terrace, a favourite spot for a before-dinner or late night drink, and gathering place for folks entering and leaving the main level of the dining room. 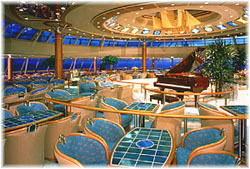 On the Vision of the Seas, the dining room, designed by Robert Tillberg has a capacity of 1200 passengers (two sittings). It's done mostly in blue and orange, with some artwork displayed. The upper level encircles the lower level (deck 4), and has an enormous chandelier in the centre, which connects the two levels. There is a single, slightly winding stairway towards the starboard side of the dining room flowing from the forward section of the upper level and that broadens near the bottom. On one wall, there is a marble mural designed by Nicholas Phillip, with a theme inspired by Aquarius. There are entrances to the galley on both levels and on both sides of the galley. Next to the Casino on the main deck is the bottom level of the Theatre, the main show lounge on the Vision, with 881 seats. It is a very comfortable room, and offers individual leather seating with drink holders on the seats. Her layout is very good, and there are only two pillars on each side that obstruct vision and virtually all seats face the centre of the stage, including the balcony seats. The balcony level of the theatre is scalloped so that there are more rows toward the front than the rear. The Masquerade Theatre offers the latest in sound and light technology that make possible virtually an infinite number of possibilities for the presentation of productions. There are three banks of stage lights, a semicircular montage of lasers, automatically moving lights above the stage. There is also a movable orchestra pit and stairways on each wing of the stage. The stage has risers that can be elevated or lowered to stage level. Over the galleys, on the Mariner deck, is the Some Enchanted Evening Lounge with 490 seats and a large dance floor, stage and bar. Floor to ceiling windows provide lots of natural light and splendid views. Njal Eide used a splendid mixture of materials and colours to create an intimate atmosphere. 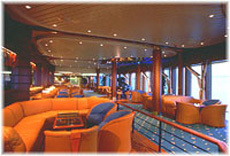 The Lounge sees plenty of action during the cruise, with nightly activities such as dancing, karaoke, and games. Forward of the lounge is the Schooner Bar, an old standby in the RCI fleet. Shades of canvas and wood make the room very attractive. It is basically a straight corridor on the starboard side, with the piano located approximately halfway along the corridor along a huge window. There is almost constant traffic passing directly in front of the piano and this tends to reduce the warmth and cosiness of what otherwise would be a delightful setting to listen and sing along. The Windjammer Cafe', located under the radar mast, occupies the entire forward section of the sun deck, and with a capacity of 660. It serves everything from buffet breakfasts and lunches to late afternoon snacks, to midnight snacks, but it doesn't serve dinner. Offering good panoramic views, this lido cafe is on a single level, with some seating extending aft to open areas of the deck on either side. There are two buffet lines and some wooden models of sailing ships. Above the Windjammer Cafe', is the Fantaseas Lounge, including a video arcade and a boozeless sports bar (starboard side) and the Club Ocean, the children's lounge, a multi-purpose indoor playhouse (port side). At the forward end of this deck is the glass ceiling of the Windjammer Cafe and an Observatory. Aft of the Windjammer Cafe is the outdoor pool area, with the standard pool bar located at the forward end, a small dancing area in front of the bar, and 4 jacuzzis (two on each side) covered by canopies located about halfway across the outdoor pool area. The Viking Crown Lounge overlooks the pool area, but as it is located amidships, the outdoor pool area is smaller than in the Sovereign class ships. surrounds the area one deck above, on the Compass Deck. In between the jacuzzis is a fountain that randomly sprays cold water around the area, including people in the hot tubs. Next to the fountain is a wading pool. This is the main outdoor innovation in the Vision class (also the first two ships of the Vision series were fitted, aft of the funnel, with the biggest minigolf course afloat). This attractive indoor/outdoor area with 236 seats, in Mayan and Aztec motifs, with scultures, tapestries and mosaics everywhere. It also includes lots of padded chairs, a fairly large swimming pool, two jacuzzis, a bar at the forward end, and a cafe on the aft end that serves pizzas, hamburgers, hot dogs and fries pretty much all day and all night (except during dinner). There's lots of room to sit and relax as the area covers the width of the ship. The "crystal canopy" roof provides lots of natural light during the day and star-gazing at night. The pool has two spouts shooting water into it, which creates a ripple effect. The entrance to the beauty salon is located on the starboard side at the aft end of the Solarium, and the salon extends through the lower portion of what would be the smokestack to the stern of the ship. Is is located directly above the Beauty Salon/Health Spa. Here there is a gym with Universal equipment, stair-steppers and other workout equipment, as well as a pretty large aerobics area. Outside on either side of the Shipshape Center there are shuffleboard courts. Onboard there is no basketball court. Along the sides of the upper area of the Solarium the Compass Deck (10) widens out. This used to be a good spot for sitting on a deck chair, watching the passing parade or the horizon. There was plenty of sun and also some protection from the wind, and the area tended to be fairly quiet. This deck is now a bit noisier as you proceed forward to overlook the outdoor pool area. The Viking Crown, located on deck 11 is designed as the uppermost extension of the Centrum. Unlike the 360-degree single-level lounge on the Sovereign group which offered primarily quiet drinks and peaceful conversation, Vision's Viking Crown Lounge is divided into four connected but specific sections. There is a fairly quiet bar forward, a slightly elevated section with tables and chairs on either side and a state-of-the-art disco dance floor in the center, the upper level of which features a DJ's booth overlooking the dance floor, and an aft section somewhat isolated from the rest of the Lounge meant for quiet drinking and conversation, with a piano tucked away in a corner of the area. I think the aft section piano bar works well, and her big glass wall aft is splendid. The Viking Crown works mainly as an observation lounge by day and by night, but I think that there could be many uses in this limited space. The passenger cabins are distributed over 5 decks and extend all along the ship's length. There is an outside cabin percentage of 60%. There are eight stateroom categories on the Vision of the Seas. Almost 25% of the cabins (the outside cabins housed on decks 7 and 8) have a balcony, including some of those on the stern side. Unlike its more crowded Sovereign class predecessors, the Vision is designed with the private cabins primarily located along two corridors per deck, (each wide enough for wheelchairs to turn around) one on each side of the ship. 140 cabins are communicating ones and, in addition to the 14 cabins for handicapped people, the suites, the Owner's suite, and 20 standard cabins are wheelchair accessible. RCC has had a reputation for small but functional cabins predicated on the premise that if you keep people occupied day and night, they won't think or care about a somewhat small cabin. The company added more space and made modifications to the cabins on the Vision class ships. Brass, mirrors and a well-planned lighting system create a comfortable atmosphere. All cabins now have a sitting area with sofa or at least an easy chair and glass table, quite a bit more storage space, including a shelf safe for valuables, twin beds that convert to a queen size bed and interactive TV that allows guests to order shore excursions or gamble from the comfort of their cabin. The smallest type of cabin, the standard inside, measures 13 square metres. The ship is fitted with a diesel-electric plant, with four diesel engines coupled to 15,300 KVA alternators. The two 17 MW propulsion motors drive highly skewed propellers. A high 23.5 knots trial speed was reported; the normal cruising speed is 22 knots. Redundancy was provided for by dividing key machinery areas into two sections configured for independent operation. The ship is virtually vibration free and the smoke emissions are very low. There are 18 elevators on board, including two scenic ones installed in the Centrum. Passenger confort at sea in enhanced by fin stabilizers. RCC is taking great care to be environmentally friendly. Royal Caribbean established last year the Ocean Fund to protect the marine environment. The systems for environment protection on board are well beyond the current and future regulations to give increased safety and to take into consideration the "green concept". The Vision of the Seas is as ecological as possible: recycling and waste sorting for glass and cans is extensive; large on board storage capacity for on-shore unloading of waste, garbage, etc; reduction of gas emissions from the power plant and incinerators; a dynamic positioning systems is fitted to automatically steady the ship without anchors when she cannot dock; etc. My overall impression of the ship is very favourable in almost every aspect. For the third consecutive year, Royal Caribbean has one of the best cruise ships in the Mediterranean during the summer season. Vision of the Seas is beautiful, inside and out, with great attention to detail (especially the artwork scattered generously throughout the ship) and the presence of glass almost everywhere that adds extensive natural light.